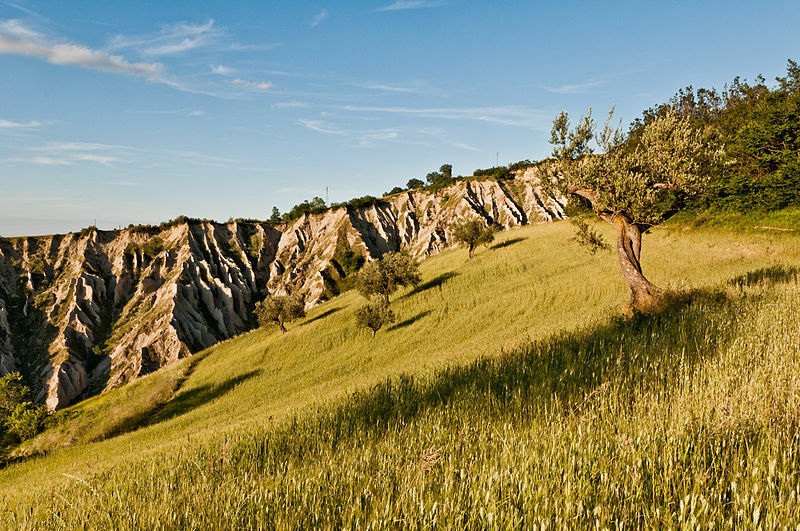 Calanchi di Atri is a beautiful nature reserve in the Apennine mountain range. 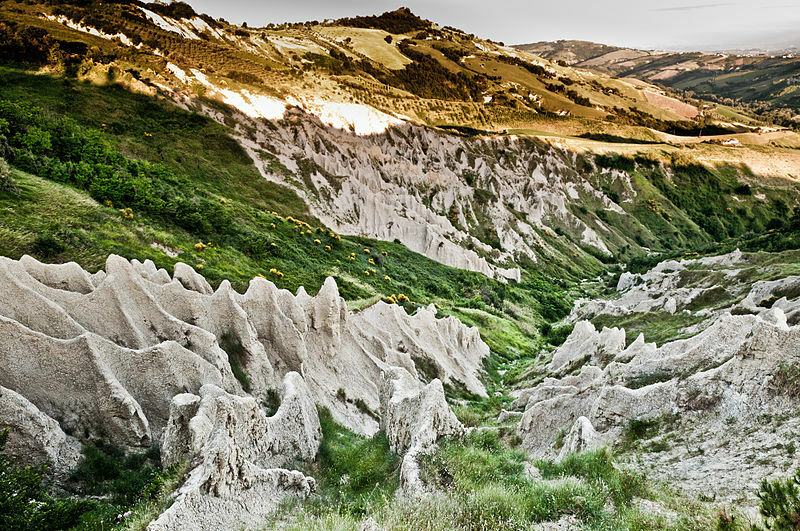 Calanchi di Atri nature reserve, in Abruzzo, presents impressive forms of erosion: the badlands of Atri, also known as Dante’s pits, are landforms created by running water, eroding clay soils without forest cover. 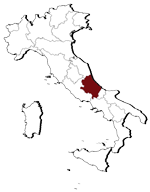 The protected area covers 380 hectares on a hilly landscape ranging from 100 meters to 500 meters in elevation, from the valley floor of the Piomba stream to the hill called Colle della Giustizia. 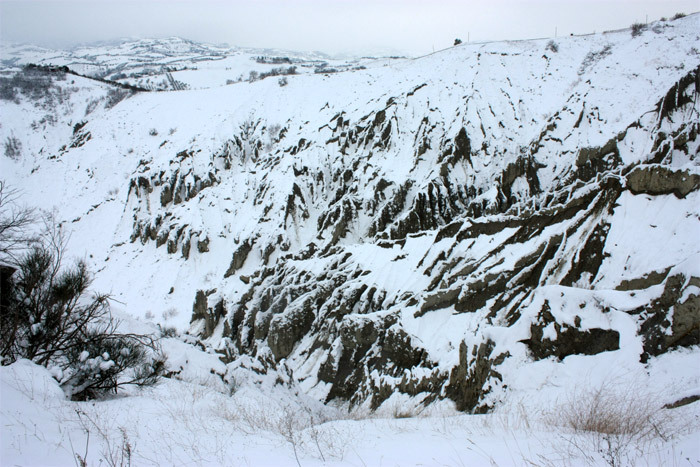 The badlands are the result of a geomorphological phenomenon of erosion that typically occurs under the Mediterranean climate. Wildlife researches have reported a significant presence of animal species in the Reserve and the research on small mammals distribution has identified nine species including the garden dormouse and the etruscan shrew. What is actually most remarkable is the finding of alpine pine voles in Abruzzo, their presence has been determined by very recent studies in the area of Majella. There is also a study on the “bat fauna in the badlands”. Bats, insectivores that have an important role in limiting the number of their preys, some of which are harmful to humans and crops, such as mosquitoes, phlebotomus and snout moths. Despite the lack of studies, many researchers believe that the number of bats is decreasing, mainly due to environmental changes caused by man (deforestation, renovation of old buildings, toxic chemicals used in wood treatment, abandoned caves closure and every other condition that limits the availability of roosts, hibernation and reproduction of bats).